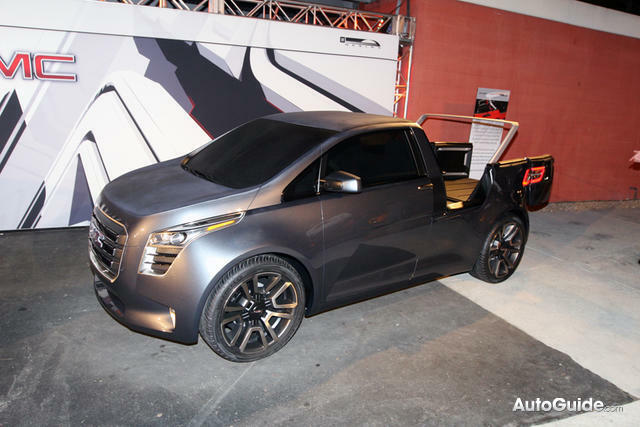 At the 10th anniversary of GM’s North Hollywood Advanced Design Center, GM unexpectedly unveiled a surprising little compact concept car based on the GMC Granite Concept unveiled last year. 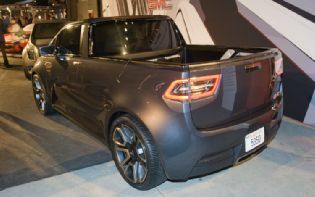 The vehicle is the Granite Compact Pickup – it’s identical to the Granite urban utility vehicle from the grille to the b-pillar, but adds a small truck bed behind the 2-seat cab. 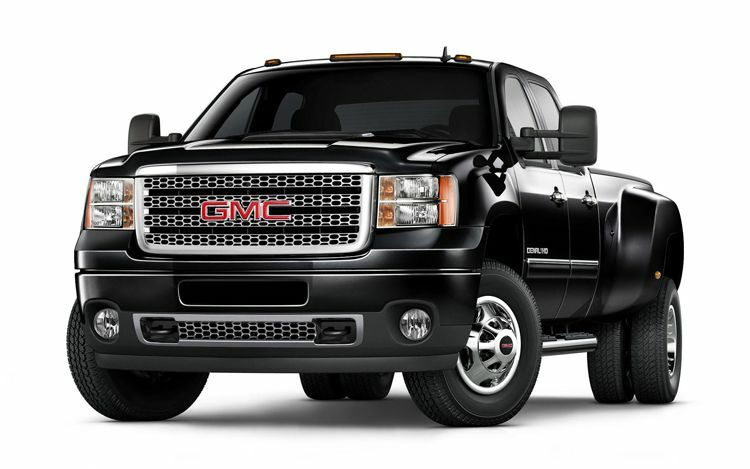 The wheelbase is only around 110 inches, but its 4-foot-long cargo box can be extended to 6 feet. Two side-hinged Dutch-style doors replace a conventional one-piece fold-down tailgate. When the doors are opened, a pallet that forms part of the floor of the cargo box can be pulled out to provide extra bed space. The cargo box also features small access doors down the side of the box to provide easier access to the space directly behind the cab. Power would be provided by a 1.4L turbocharged 4-cylinder engine mated with a FWD propulsion system, creating the incredible fuel economy of a small car, with some extra utility (albeit small) from the bed in the back. 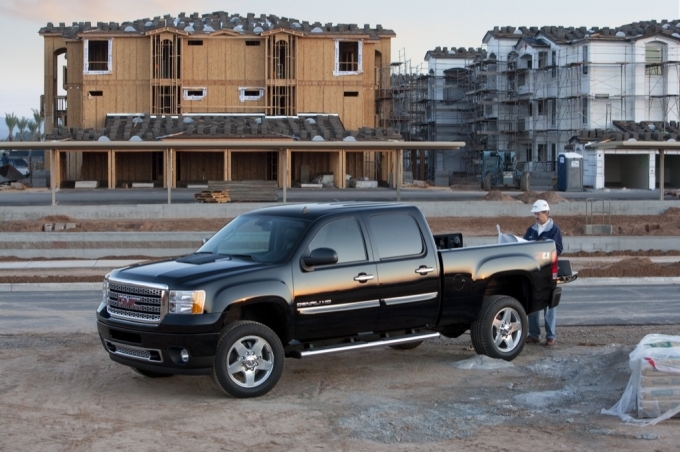 The truck is not likely to be produced, at least not anytime soon, but its styling and size harkens back to the Chevrolet LUV of the 70s which found a niche market, and was popular in California. 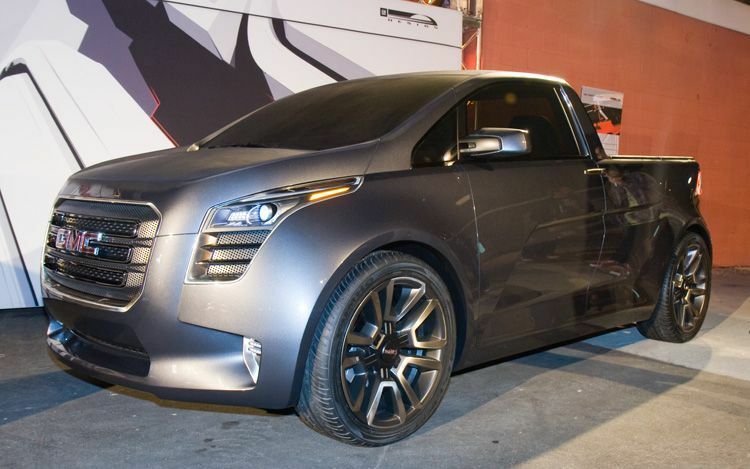 We’ve already shown how much we like the wild styling of the original Granite urban utility vehicle, and even though this small market truck is unlikely to see the road, it’s nice to see some new and interesting ideas coming from the General! As part of a friendly competition here in the dealership, a few members of our staff got to attend the NASCAR race – the Kobalt Tools 500 – this past weekend in Phoenix, AZ. As a part of the lucky winning team, I was part of this group and was able to witness my first (hopefully of many) race and wow what an experience! Now I won’t call myself a NASCAR diehard, I can name a few of the drivers and keep up with the standings because I watch SportsCenter religiously and catch the results of the races, but the thrill of actually being at the race – and in the atmosphere of the massive tailgate party before hand – is second to none. I can’t picture myself sitting on the couch and watching cars drive for 500 miles, but being there in person is a whole different ballgame. The roars coming from the motors, the roars coming from the crowd, the smell of burnt rubber and Budweiser, all of it makes for a truly unforgettable experience. 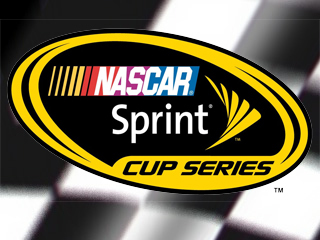 Seeing as we were all attending our first NASCAR race, we figured we better brush up a little bit on current standings, and we found that with 2 races to go, it was the closest Chase For The Sprint Cup in history, between 3 drivers – ﻿Denny Hamlin, 4x defending Sprint Cup Champion Jimmie Johnson, and Kevin Harvick all within 59 points of eachother. Johnson was also the 3x defending champion of this particular race, known as the Checker O’Reilly Auto Parts 500 for the previous 2 years, so it made for a very interesting run up to race day. 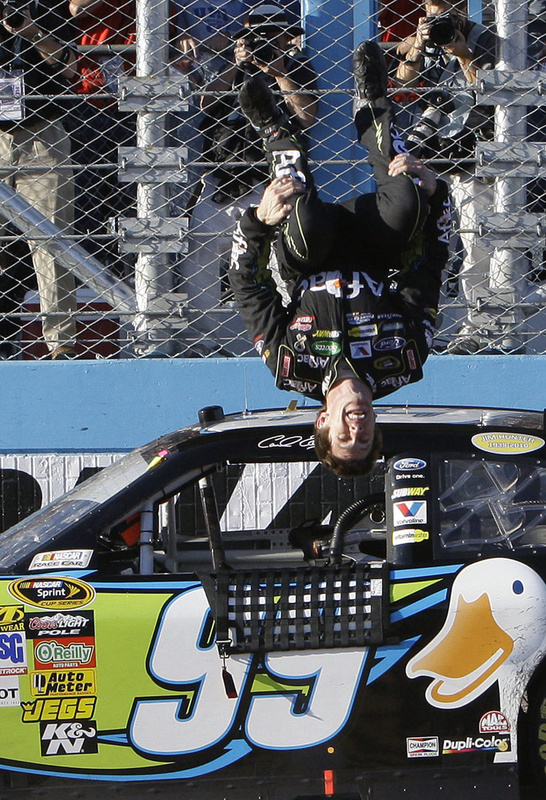 Carl Edwards ended up taking the top spot in a very exciting race, Ryan Newman opted not to pit for fuel late in the race and it paid off as he finished 2nd, while Joey Logano took 3rd place on the podium. Johnson finished in 5th, Harvick 6th, and Hamlin back in 12th to tighten the Chase up even more with Johnson 15 points back and Harvick 46 points back heading into the final race this weekend in Miami. Now I’ll admit, the actual race itself, as exciting as it was, still wasn’t the best part of the afternoon – it’s hard to imagine without actually being there, but the sight of over 100,000 people – many in RVs that had been there for a few days – all at that track was unbelievable. We showed up a few hours early to take in as much of the experience as we could, and spend a good portion of that showing our ways through the countless tailgate parties happening at RVs parked in the lot. It’s safe to say those fans who had been there all week had been having a very, very good time and they were more than happy to invite a few more strangers into the bunch – one of the sites we went by actually had a full slate pool table set up next to their RV! A good time was had by all of us who attended the race, and I think we all agreed that we’d be more than happy to be able to go to another NASCAR event – but next time I know I’ll be renting an RV and spending the week! Big thanks to Tim Davis for sending us on an unforgettable trip.